Earrings: J Crew (old). Coat: Whistles (old but buy similar from M&S here). 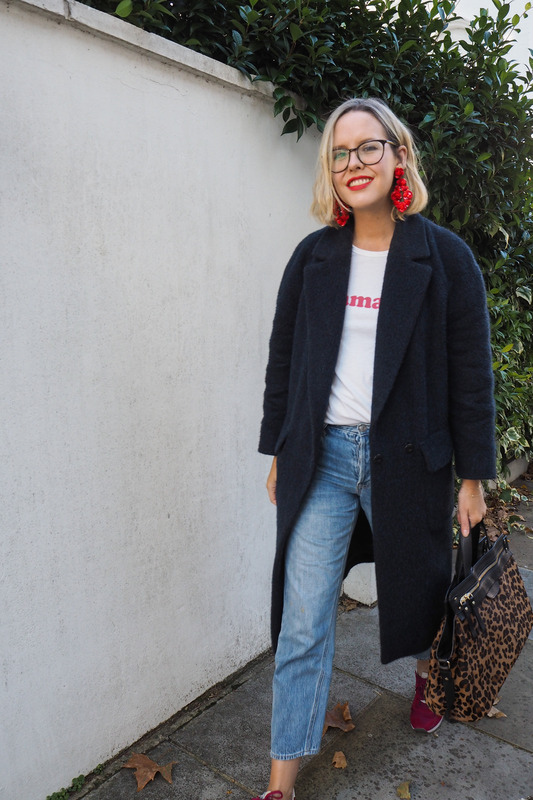 Tee: Sezane (old). Jeans: Gap (old). Bag: £360, Sezane. Trainers: New Balance (old but this version are great). Photographs: Christopher O’Donnell. 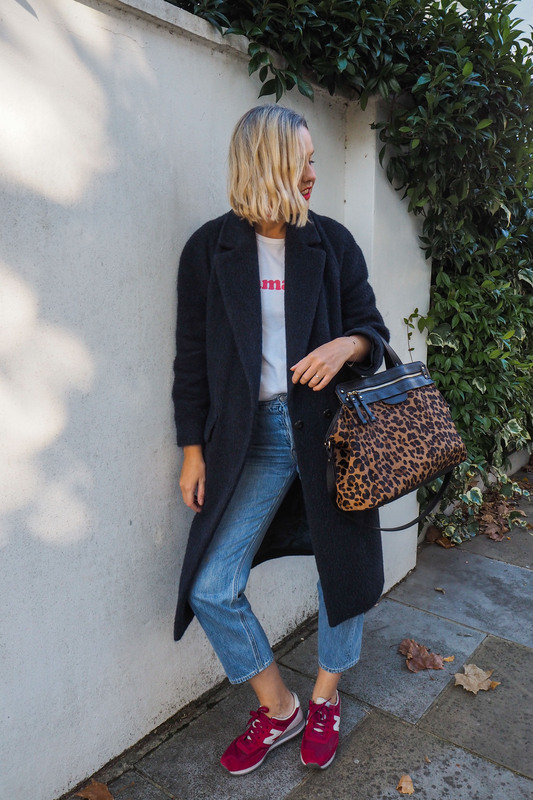 This was supposed to be a really thoughtful piece about building up a capsule wardrobe, but, in fact, I realised as I was packing for this shoot that this is basically all of my favourite, most worn items in my wardrobe. And what better capsule wardrobe is there? Yes, leopard print is having a huge moment (again!) but it is a print I have sworn by since working in fashion. 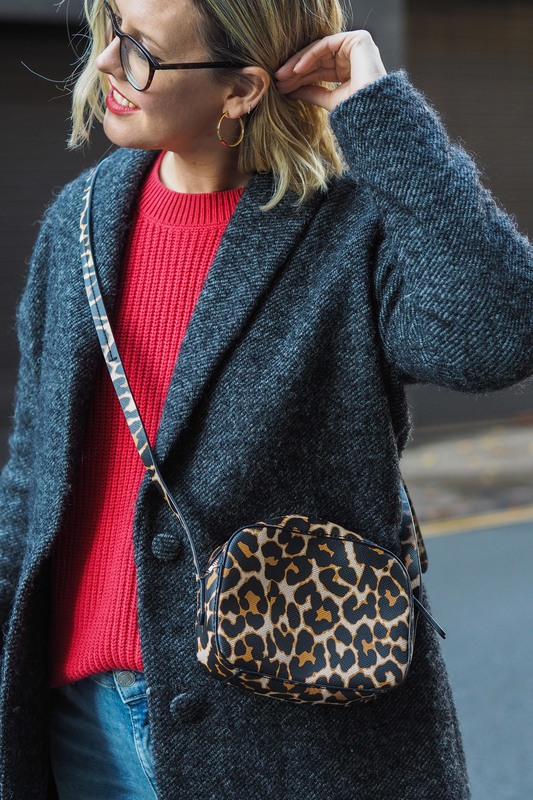 Us fashion lot always go on about leopard print being a neutral but it really is a total outfit maker. 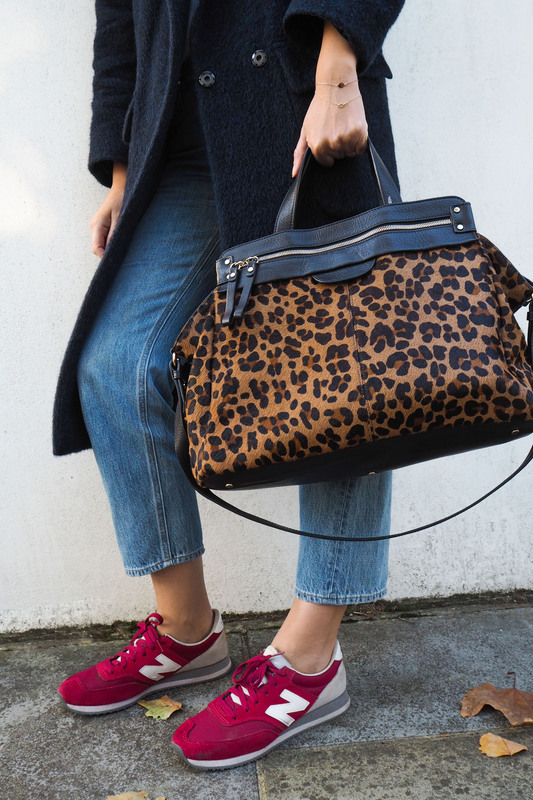 My leopard bag from Sezane (a gift, I picked as my baby change bag!) is barely away from my side and I get so many compliments on it. Wear it with something simple like jeans and a tee and you’re done. I only started wearing red a few years ago. funnily enough, and now it has become somewhat my signature look! Since having a baby, especially, I find a red lip (I’m wearing Trish McEvoy Lip and Cheek booster in ‘Red’) can really help you look less tired and lift a no make-up day (I often try and limit the amount of makeup I put on my skin due to acne issues). For me, jeans are such a failsafe staple to my wardrobe. Admittedly, so much so sometimes that I have to break free and have a series of wearing dresses or wool trousers to try and shake things up. But they go with everything and just so easy. Since pregnancy, again, I only really have three pairs of jeans left in my wardrobe (most of my smart trousers don’t do up!) and thankfully, they’ve seen me through the last seven months. These are the crop kick from Gap (whch are instore only) but I am mainly wearing straight leg these days, the idea of pulling up skinny jeans post pregnancy fills me with fear now! 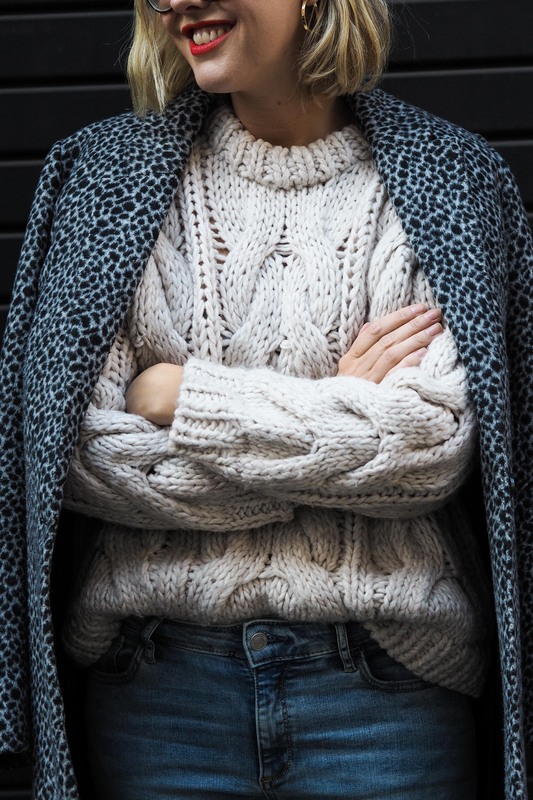 Jacket: Sezane (old). Jumper: £19.97, Gap. Bag: J Crew (old). Jeans: Gap (instore only). Boots: Tabitha Simmons (old). Quite a few of the items in this post cost me a lot of money. I remember I was working at Red when I bought these leopard boots, I knew they’d go with everything and thankfully they are super comfy. They cost almost half my monthly wage (I put them on my credit card which I have paid off now, thank god) but to this day I don’t regret it. Well, maybe it wasn’t financially the best decision I ever made but sartorially? Yes, yes it was. And they’ve saved me money in the long run as I haven’t really bought many other boots over the last 5 years. But the thing about good investments, and keeping to a style that’s ‘you’ means that you will always be able to pick out the pieces that will last in your wardrobe. A good coat will get you everywhere. I am always drawn to the same style of outerwear: slick, tailored, quite long, usually oversized and often statement. This coat ticks two of my style credential boxes – leopard AND tailored so I just knew it had to be mine. I picked this up from Maje in Bicester Village last year and although I was pregnant for pretty much the entirety of last winter, I knew it would come out the following year and make me smile. And it has done. Coat: Maje at Bicester Village (old). Jumper: La Redoute (old). Jeans: Gap (instore). Shoes: Boden (old). 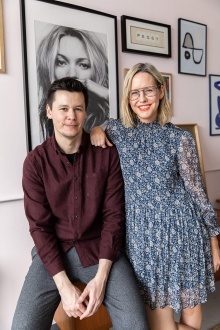 Thanks to all the feedback on previous posts, I am no longer apologising for my clothes being old – it feels so nice to be appreciated for styling up my existing wardrobe. Instead, where I can I will do an edit at the end featuring some items that are relevant…hope this post has proven useful for items to look out for which will keep your wardrobe looking and feeling fresh, no matter what the trends are. in all its forms too ! I don’t wear red – am very pale but admire it on others!! I’m also trying to work out my go outfits. Tired of spending money on clothes I never wear. I want to spend my spare cash on the theatre, holidays or the house.